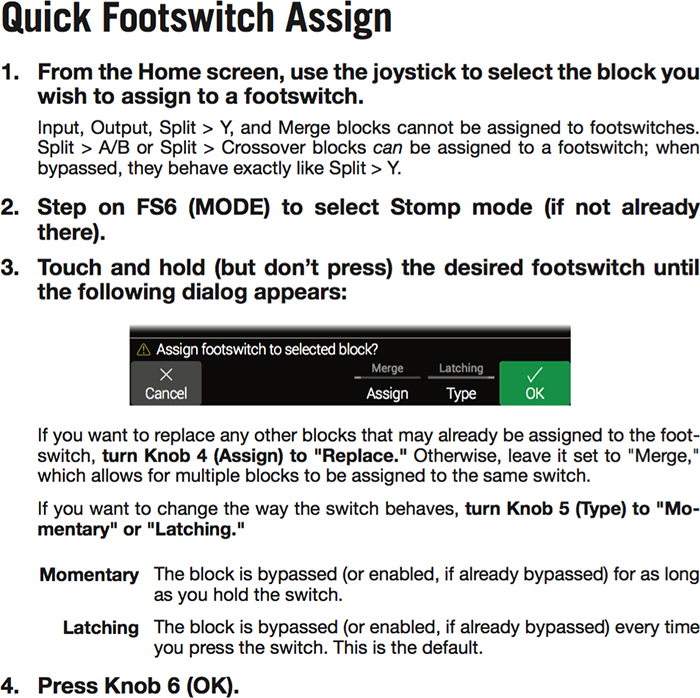 After struggling with this for a while myself I think I found a consistent and easy way to assign multiple blocks to a footswitch and easily bypass the ones I want bypassed when the footswitch is off with predictable results. This may seem obvious but the previous method I was using always seemed to leave me having to save and go back and play with the bypass states again to get the blocks I wanted coming on and off with the footswitch ring reflecting their state properly. Sheesh, with all that tapping and touching and squeezing this post was starting to remind me of an old Journey tune. Save save save. In fact save after every 1 or 2 assigned. Just a quick double press of the "save" button. When multiple blocks are assigned to one switch and you want to know what controls the state of the led, it will be the block selected from the blocks assigned to that switch. So in between step 6 and step 7 of HonestOpinion's procedure, do another tap procedure similar to step 6, but this time the objective is to just select the block you want controlling the led. Note also that in Step 4 you need to ensure that the assignment will merge with, and not replace, existing assignments. There is an option to choose the behaviour you want. The default is merge so if you are unaware of this option you will get the multiple assignments you want. But if you are not aware and the option happens to be set to 'replace' you will get very confused. Yes, Helix will remember which of the (up to) eight items is "in focus" when saving your preset, and the switch LED's color and dim/bright state will reflect this. A really important point, thanks silverhead! A great jumping off point thanks! I wanted to make it clear how to set the bypass state for each block as the manual might be a little confusing as it discusses bypass in the context of whether you are setting the bypass mode (momentary vs. latching) rather than the bypass state (block on or off). THANK YOU, THANK YOU, THANK YOU! If this works HonestOpinion, I'm going to name my next child after you! Chuckle, hope it's a boy or that could be awkward :) Let me know how it works out for you or if the instructions need clarification. Can we pin this please?!!! Not yet, let's hope it is on the way. Hopefully somewhere down the line with the new editor at least.